of the Collective and Cyclick. 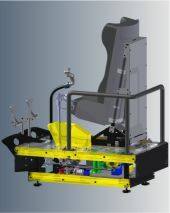 Construction of the seat adjustment. since around 1996 in 3-shift operation. commissioning in Hungary was carried out by us. of dough in the proofer. in close cooperation with specialists from Germany. We develop and design special machines, handling systems, devices, tools and mechanical and electrical equipment for different industries. Take advantage of our expertise and experience from the practical insights of several 1000 designs. On request we will send you complete solutions, from ideation to deployment in your production, the production of your customers or suppliers, as well as the process optimization of existing plant and machinery. Get our system and cross-industry experience as a design office or as a system supplier. The experiences from the different, for customers optimally solved tasks and knowledge of technical matters, helps us to find apt solutions for the tasks. The numerous successful projects in various industries, we have achieved a high degree of independence industry.